A series of obscure elections took place over the past few weekends with potentially profound implications for the fate of the California Democratic Party, which has been roiled by infighting in the wake of Eric Bauman’s resignation as chair amid sexual misconduct claims. 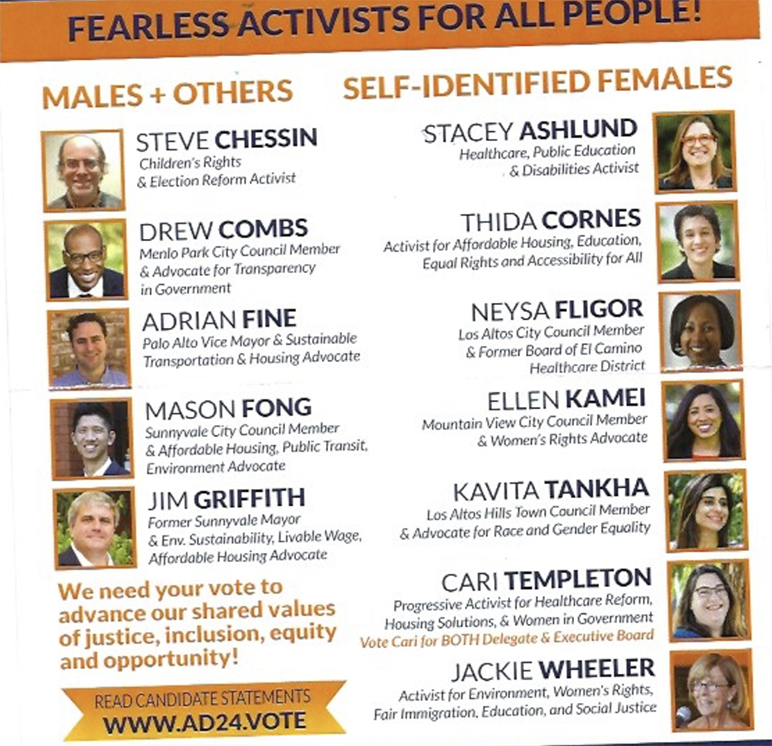 The biennial elections of Assembly delegates, known as ADEMS, install 1,000 people into party leadership with power to decide which candidates to back, policies to support and who should helm the most powerful political machine in the state. 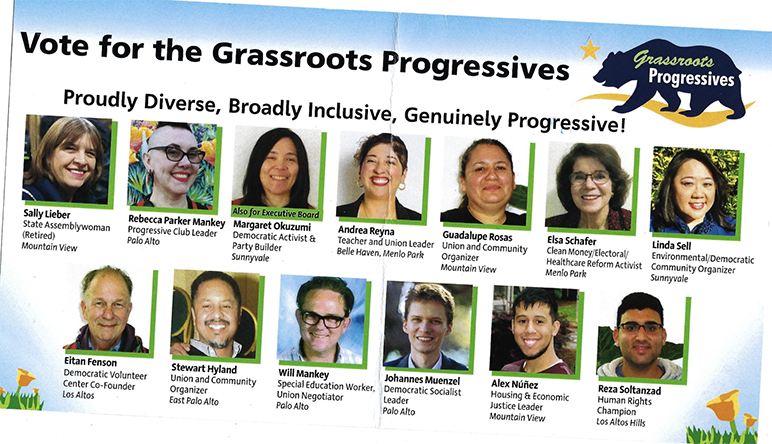 Generally, it seems, the ADEMS became a contest among democratic-socialist Berniecrats, moderates and insiders. Locally, Assembly District 24 saw one of the biggest turnouts and results that reflect the direction of the party as a whole. At least, that’s the way veteran Dem activist Prameela Bartholomeusz sees it. 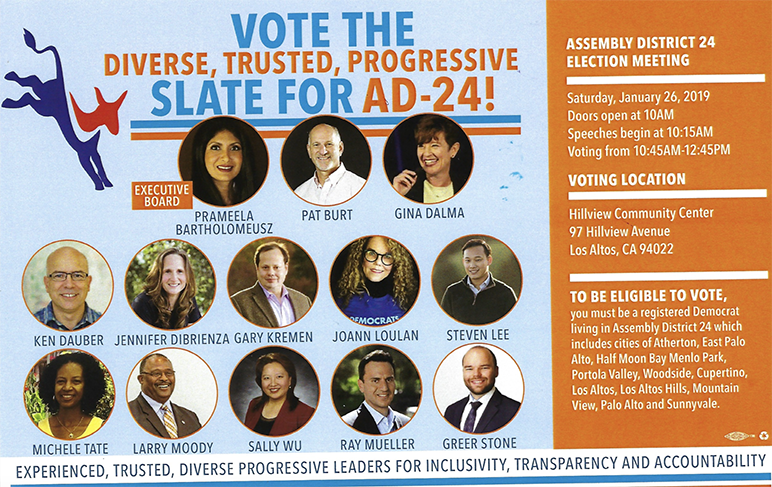 The executive board member of the Santa Clara County Democratic Party put together the most successful slate in a field of 40 contenders, trouncing the establishment pack (featuring, among others, Mountain View Councilwoman Ellen Kamei and former Sunnyvale Mayor Jim Griffith) endorsed by AD24 Assemblyman Marc Berman (D-Palo Alto) and progressives led by former AD22 Assemblywoman Sally Lieber. To Gary Kremen, who ran on the same slate, the thousand-plus folks who cast their vote Sunday at the Hillview Community Center in Los Altos conveyed an ideological point as well. That is, Dems want a more progressive party—but within reason. What is a moderate Dem, one who wants to take less of the money you earn and give it to someone else than the Berniecrats and insiders want to take from you and give to the slackers? I am not going to speak for other democrats; I am a moderate democrat. I am pro-life, pro-gun control, Vote for democrats, republicants, vote for causes and individuals not party’s chosen candidates, feminist, pro equality. I believe people have the right to be pro choice, pro life, gay, straight, religious, atheist, Dems, Reps, Green, male, female, other…and be respected and protected equally under the law. This is freedom. I do not share extremist left or right thinking; I stand at the middle of the political spectrum and views. Humans and societies are complex and abstract constructs not a black or white Matter. I am a moderate democrat! Regular Americans would be curious to know what meaningful difference there is between a “moderate” leftist, a leftists, and a “far” leftist? Is it just a difference of the share of wealth of private citizens that they are willing to seize and redistribute? Fifty percent? Ninety percent? One hundred percent?